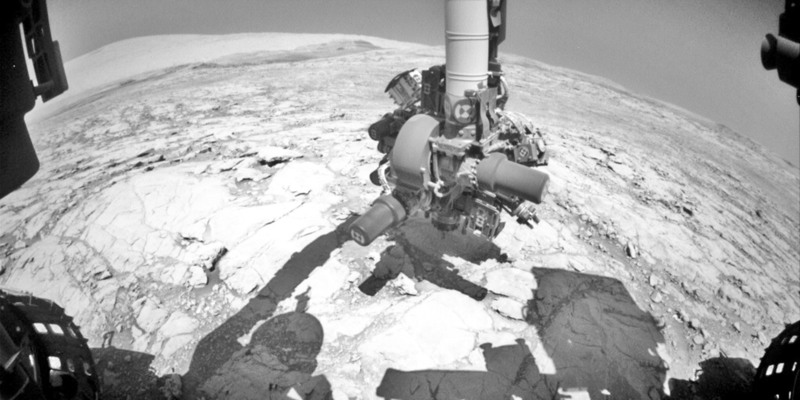 NASA's Mars rover Curiosity is making strides toward bringing its rock-boring drill back online. On Oct. 17, Curiosity pressed its drill against a Martian rock for the first time since December 2016, as part of a test designed to help assess the feasibility of a new drilling technique, mission team members said. That technique involves using Curiosity's 7-foot-long (2.1 meters) robotic arm to push the extended drill bit into rock, without the aid of two stabilizing posts. In the old method, the stabilizers were pressed to the rock, one on each side of the withdrawn bit; the bit was then pushed forward via a "drill feed mechanism." But the feed mechanism , and Curiosity hasn't drilled a rock since. That's a big deal, because analyzing the powder pulled from the interior of drilled rocks is at the core of the rover's $2.5 billion mission. Such analyses have allowed the rover team to determine that Mars' Gale Crater—which Curiosity has been exploring since the probe's August 2012 landing—could have in the ancient past. During the Oct. 17 test, Curiosity pushed the extended drill bit against a Martian rock, then exerted some side-to-side force, measuring everything with an onboard force sensor. "This is the first time we've ever placed the drill bit directly on a Martian rock without stabilizers," Douglas Klein, of NASA's Jet Propulsion Laboratory (JPL) in Pasadena, California, said in a statement. "The test is to gain better understanding of how the force/torque sensor on the arm provides information about side forces," added Klein, the chief engineer for Curiosity's return-to-drilling work. A Curiosity-like test rover at JPL has managed to collect samples from drilled rocks using the new extended-bit technique, mission team members said. "The development work and testing here at JPL has been promising," Curiosity deputy project manager Steve Lee, also of JPL, . "The next step is to assess the force/torque sensor on Mars. We've made tremendous progress in developing feed-extended drilling, using the rover's versatile capabilities beyond the original design concepts. While there are still uncertainties that may complicate attempts to drill on Mars again, we are optimistic." Even if everything goes perfectly, however, it will still be several months before Curiosity resumes full-on drilling operations on Mars, NASA officials said. The car-size rover is nearing the top of the 20-story-tall Vera Rubin Ridge, a landform on the flanks of Mount Sharp, which rises 3.4 miles (5.5 kilometers) into the sky from Gale's center. Mission team members want Curiosity to keep climbing up through the mountain's foothills, reading a history of Mars' past environmental conditions in the rocks along the way.